Less than two weeks after Uber settled its California and Massachusetts misclassification lawsuits, other states’ drivers are clamoring to get their own easy payday. The Los Angeles Times reports that new class action worker misclassification lawsuits have been filed in Florida and Illinois. Even though the previous settlement stated the company’s workers were independent contractors, not employees, that hasn’t stopped other greedy plaintiffs from getting in on the action. Florida and Illinois lawyers state the multi-billion dollar company violated the Fair Labor Standard Act in their states, and they want to recover unpaid overtime and expenses. Brian Mahany, a lawyer representing plaintiffs in Illinois, said these workers were entitled to minimum wage and overtime. 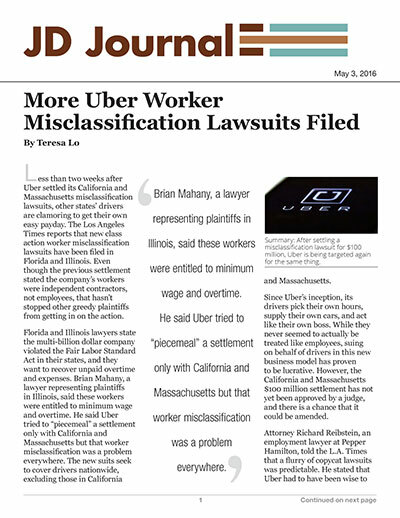 He said Uber tried to “piecemeal” a settlement only with California and Massachusetts but that worker misclassification was a problem everywhere. The new suits seek to cover drivers nationwide, excluding those in California and Massachusetts. Since Uber’s inception, its drivers pick their own hours, supply their own cars, and act like their own boss. While they never seemed to actually be treated like employees, suing on behalf of drivers in this new business model has proven to be lucrative. However, the California and Massachusetts $100 million settlement has not yet been approved by a judge, and there is a chance that it could be amended. Attorney Richard Reibstein, an employment lawyer at Pepper Hamilton, told the L.A. Times that a flurry of copycat lawsuits was predictable. He stated that Uber had to have been wise to the fact that this would happen. Although it is not yet known what the company will do with these two new cases, the ride-share company has already said in a statement that if its drivers became employees, they would start driving in shifts, earn a fixed hourly wage, and lose the ability to drive for whoever they wanted to. In essence, the popular model that is working right now will cease to exist. The Los Angeles Times spoke with an expert that said class action suits against the same defendant typically do not happen. One suit ends up trumping the other, although it is not uncommon for attorneys to team up. According to the L.A. Times, it is unclear what the Florida and Illinois teams plan to do in regards to their conflicting cases.